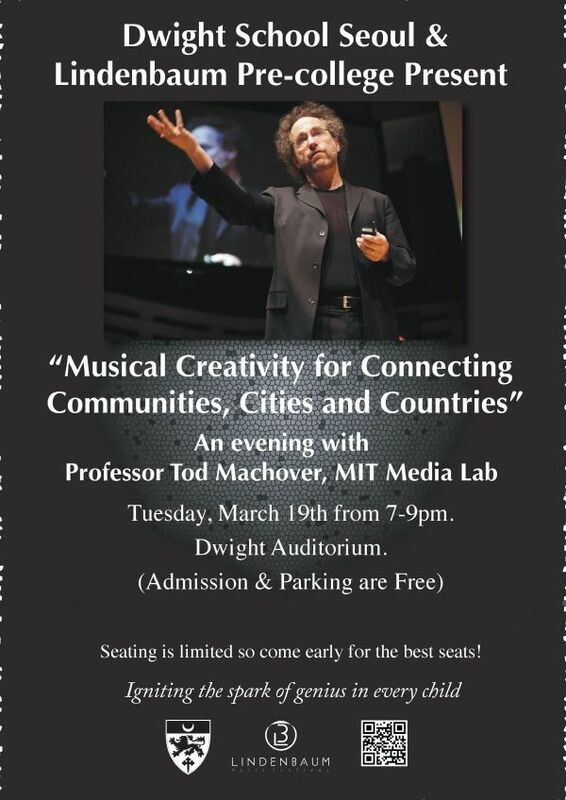 As one of the most forward-thinking composers of today, Tod Machover from MIT Media Lab never stops making music. He not only composes robotic operas and creates what are called “city symphonies,” making various sounds from urban environments into music that are performed in an orchestral pit, but he has also helped Alzheimer’s and cerebral palsy patients communicate through music. He is also part of a team that recently made headlines for a groundbreaking achievement that suggests Alzheimer’s disease may be cured simply by looking at flashing lights and listening to flickering sounds. Why not, then, get his help and try to get the two Koreas to communicate and find a way for a peaceful unification through music? This is what violinist Won Hyung-joon, who also directs Lindenbaum Festival Orchestra, instantly thought when he saw the documentary “Symphony in D,” directed by Dennis Scholl and Marlon Johnson at Indiana’s Heartland International Film Festival in 2017. “I was inspired by Machover, a Pulitzer Prize-nominated musician, who tried to rebuild the city of Detroit through music,” said Won. The film shows how the composer got citizens of Detroit to contribute in collecting the sounds of the city. He received over 15,000 individual contributions and for over 13 months, Machover assembled the materials and turned it into a symphony to be performed by the Detroit Symphony Orchestra, conducted by Leonard Slatkin and accompanied by Detroit citizens. “I thought if I asked him to participate in the Lindenbaum Project, we may be able to realize, or get a step closer to, a real peaceful unification of the two Koreas through music,” Won added. Won has been attempting for more than a decade to bring musicians from the two countries together in one place to perform and prove to the world that peaceful harmony can be realized through music. There have been various incidents when his lifelong mission was just steps away but fell through at the last minute for political and security reasons. By knocking on Machover’s office at MIT Media Lab and talking to him about his project to bring peace in the Korean Peninsula through music, Won got Machover to get on a plane and visit Korea for the first time on Sunday. Until Thursday, Machover will tour around Korea, including the demilitarized zone, street markets, like Namdaemun Market, Gyeongbok Palace and meet up with the Koreans who will help him write the “Symphony for the Koreas,” which Won and Machover hope that South and North Korean musicians can one day perform together. Machover also delivered a speech on Tuesday evening at the Dwight School Seoul’s auditorium in Mapo District, western Seoul, titled “Musical Creativity for Connecting Communities, Cities and Countries” and talked about his plan with the Lindenbaum Festival Orchestra to create music for the Koreas using his specialty. During his visit to Korea, the Korea JoongAng Daily sat down with the composer for an exclusive interview on Monday. The following are some edited excerpts from the interview. Q. For Liberation Day on Aug. 15 last year, the Lindenbaum Festival Orchestra premiered your work, “Fence-a-Dance,” which you specially rearranged for the orchestra thinking about harmony between North and South Korea. How did that happen? A. Actually, I was supposed to come that summer, but one of my close colleagues died suddenly so I couldn’t. [Instead,] I sent two students. The general idea of what we wanted to do was make some kind of a project about the peninsula and about what might be possible between [the] South and North and to maybe inspire people to think differently. Mr. Won, he is incredibly strong visioned, so when he knocked on my door, it was a little before the summer. I had just done a big project with the city of Philadelphia and it was brought to Carnegie Hall, and maybe he heard about it. He told me about his project in Korea, which got my interest, but asked me if I could write him a symphony like the one I did in the Carnegie Hall in a few months, so I said I would like to be a part of the project, but it would take a lot longer than that. He didn’t give up and he said he spent his whole career using music to bring people together to make world peace to imagine what might be possible on the Korean Peninsula. So I thought, “Oh he’s serious and he believes this,” and I believed he can do this. So I think [after] first meeting, I believed we could do something together. But there were some obstacles. One of the most interesting parts of these symphonies I compose is not just the final piece but the whole process of bringing people together to think about the piece and to use music as the way to communicate and to listen to each other and understand the situation. Moreover, the musicians in Mr. Won’s orchestra were all young people. But my music generally is really hard. It’s not the simplest music in the world. I also pretty quickly realized that Camp Greaves, in the DMZ, where the concert was going to be held, wasn’t cut out to perform the pieces that I usually compose. A lot of my music is some combination of acoustic instruments and electronics, and one of my specialties is to design fantastic systems with amplifications and speakers all over, where it sounds natural. Therefore, I needed to do something which is just acoustic because there was enough problems with the venue, and then I had to do something which young musicians can play. There are three different kinds of music in the piece. The first kind is [that] every note is written just the way I wanted. So it’s actually a little hard to play and the music is written up precisely. Then, some of the music is half and half. For instance, you play this melody, then the instruction for everybody is [to] play it again, but the second time you play it, everybody add an extra note. You can make it messy. Then the third time, I instructed the musicians to make it incredibly messy. I wanted them actually to do some composing or do some improvising outside of rehearsal, but they didn’t really have time to do that. When it was completed, I sent the piece over here, [while] I was at home in Boston. Two of my students were over here and one of my students, she wrote me an email and asked me if I would watch them rehearse via Skype. I’ll never forget that experience because I didn’t know what was going to happen. I have a certain amount of experience and almost everything happens to my music, you know. But I was so moved. Here were these young kids and it was, like, halfway during the rehearsal period and they played it incredibly well. Some of them were pretty little kids, but I could tell immediately that it was going to work. It was quite remarkable. I heard your software program Hyperscore has helped people with mental illnesses communicate through music. Do you really believe it will help people of North and South Korea to communicate? I made it almost 20 years ago because I wanted everyone to kind of make up their own music. Music is funny because everybody loves music and every society has music and music reaches us very deeply. But it is also difficult to learn an instrument, and [it is] difficult to learn the theory and rules of music. It’s special language that you have to spend a lot of time on. Also there’s a kind of real snobbism of composing music. But I thought that making up your own music is a wonderful thing. My mom taught me that and we used to make up music as little kids after our piano lessons. So I wanted to make a software that would let [people], especially little kids, make original music, and I wanted it to be on the computer so it’s easy to access and I wanted people to not just create melodies but make music for symphony orchestras. So that is Hyperscore. It uses lines and colors and has pretty sophisticated AI software. Then some people in the state of Massachusetts heard it and they asked me if I would be interested in working with people in hospitals, specifically people with mental problems like depression or schizophrenia. So we started workshops just with Hyperscore. I realized what is incredible about music is that, especially if it’s music with no words, you can tell a story about something very difficult, something you deeply care about, without actually having to say what the real story is. If you want to describe something awful that happened in your life, you can make music that tells that story, but you don’t have to tell somebody what that’s about. So it lets people open up in a way that nothing else does. Music is a way of connecting people through what people have in common but also let people open up about things that people deeply care about without necessarily putting words on them and it leaves us [with] some amazing things. I’m hoping to work together with South Koreans [to make] what is possible on the peninsula through music that can be sent back and forth between [the] South and North. I understand that it is very difficult, but if it can be realized, I think really extraordinary things can happen.